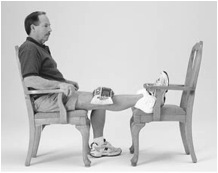 The knee flexion/ seated stretch is performed while seated in a chair. Gently slide your surgical leg behind you while keeping your foot flat against the ground. Move forward in your chair and hold the stretch for 10-15 seconds. Repeat the recommended number of times.ALL EXERCISES SHOULD BE PERFORMED AS INSTRUCTED BY YOUR SURGEON, AFTER PROPER DEMONSTRATION BY A PHYSICAL THERAPIST. 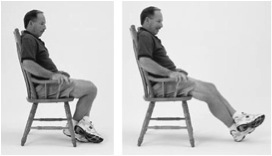 The knee extension/seated stretch is performed while seated at the edge of a chair. Gently slide your surgical leg forward and push down on the knee to straighten your leg. Hold for 10-15 seconds then pull your leg back. Repeat the recommended number of times.ALL EXERCISES SHOULD BE PERFORMED AS INSTRUCTED BY YOUR SURGEON, AFTER PROPER DEMONSTRATION BY A PHYSICAL THERAPIST. Prop foot of operated leg up on chair. 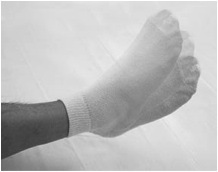 Place towel roll under ankle and ice pack over knee. Put 5-10 lbs. of weight on top of knee (a 5-10 lb. bag of rice works well). Do this for the recommended amount of time.ALL EXERCISES SHOULD BE PERFORMED AS INSTRUCTED BY YOUR SURGEON, AFTER PROPER DEMONSTRATION BY A PHYSICAL THERAPIST. Lie on back, place towel roll under thigh. Lift foot, straightening knee. Do not raise thigh off roll. Repeat the recommended number of times.ALL EXERCISES SHOULD BE PERFORMED AS INSTRUCTED BY YOUR SURGEON, AFTER PROPER DEMONSTRATION BY A PHYSICAL THERAPIST. The straight leg raise is performed in a reclined position, using your forearms to support your upper body. While keeping your leg straight, lift your leg twelve to twenty inches, hold for a count of ten, and slowly lower your leg back to the floor. Relax. Repeat the recommended number of times.ALL EXERCISES SHOULD BE PERFORMED AS INSTRUCTED BY YOUR SURGEON, AFTER PROPER DEMONSTRATION BY A PHYSICAL THERAPIST. Sit with your back against the chair. Straighten knee. Repeat the recommended number of times.ALL EXERCISES SHOULD BE PERFORMED AS INSTRUCTED BY YOUR SURGEON, AFTER PROPER DEMONSTRATION BY A PHYSICAL THERAPIST. 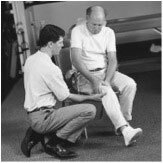 The ankle pump is performed by slowly moving your foot back and forth as far as possible. Repeat the recommended number of times.ALL EXERCISES SHOULD BE PERFORMED AS INSTRUCTED BY YOUR SURGEON, AFTER PROPER DEMONSTRATION BY A PHYSICAL THERAPIST.